BTW, this should be updated with new a ranking for Dulles since they gusted to at least 58mph. So far I have recorded 54mph on the mechanical anemometer and 62mph on the ultrasonic unit. Both are obstructed by trees to some extent, but not excessively either. 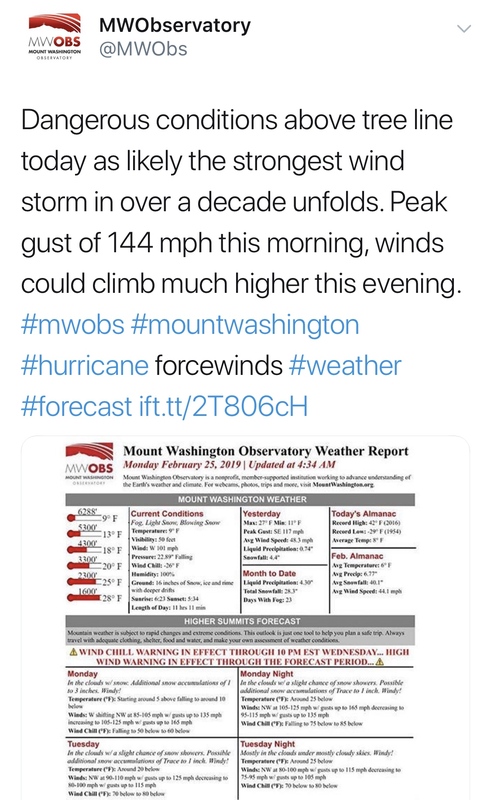 Mount Washington already gusted to 144mph, there’s a chance they could approach 180mph. 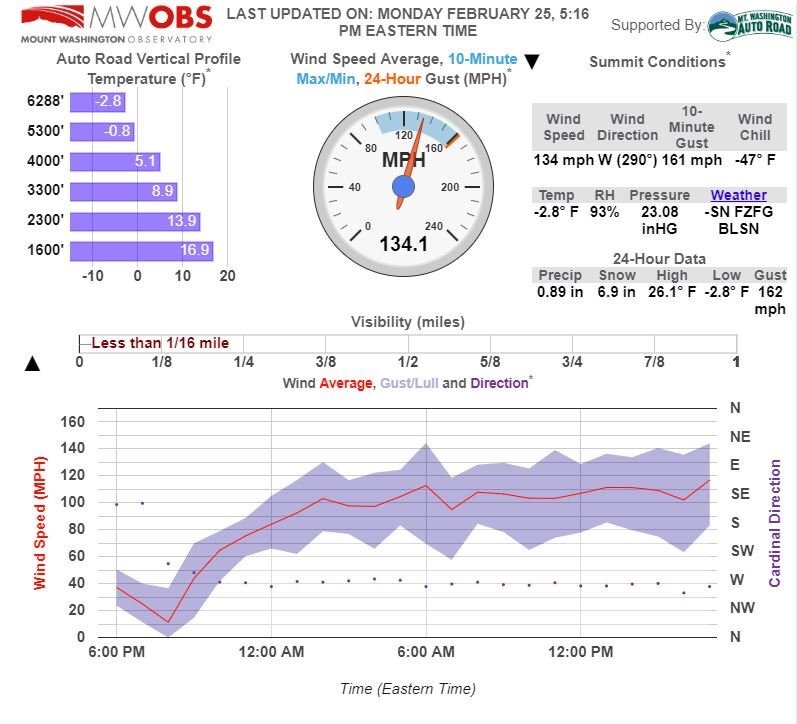 Sustained at 134mph, gusting to 162mph, and still increasing as of 545pm on Mt. Washington. It was a bad windstorm for sure. 53mph here yesterday. I never liked winds. Growing up in the South, the first thing they teach is, "black cloud bad." A Navy Chief said, "Never change your forecast. That way you can only be wrong once." Have to agree on the winds. Texas gets a lot of wind in March/April and again in October. But no thanks. Black cloud bad is so true down here. They can just be one to pound you with rain, or change its mind and rip your roof off. Far too fickle for me. But it's a great place to live. We're experiencing the doldrums right now. 58*. Overcast. Mild wind. 70* tomorrow and a front moves through this weekend with Low 40's and rain. No big whoop, it's Texas in late February. Our seasons tend to be Winter, Weird, Spring, Summer, and Weird again. Driving around, I noticed some houses missing siding on Bannockburn Drive, and one of the new houses had the central bay window frame (not the glass) blown in partially on the front, which could have been a flaw in the carpentry. Also there are homes with shutters missing and a few with shutters that are *partially* missing (like, half is missing, but the other half is fully attached). Sort of hard to envision how that could happen lol...I guess they came partially detached and snapped off in turbulent eddies or something. Been mulling that one over. Also, I’m once again impressed with the trees. Seems there is little if any weak wood remaining based on the relative lack of carnage around here after both the ice storm and now these 60+mph winds. A few evergreens were uprooted on River Road, probably thanks to the saturated soil conditions. Also, some larger crown branches were down on side streets and yards in the highly exposed areas near the Potomac River itself (mostly Glen Echo on the hill south of the bend, where the wind funnels very hard from the west). However, overall I didn’t see too many tree issues compared to what you’d typically see in a 55-65mph windstorm under saturated soil conditions. At least that is the case locally. I've been stunned at the wind in your area. It's just been amazing. We get wind here, but your totals are just crazy! The last few years have definitely had some persistently windy patterns, and from a direction that just happens to favor us. Thing is, it’s really just the W/NW winds that slam this area. NoVa and Central MD generally see enhancement from downsloping off the bend in high terrain, and my location is a NW wind funnel, sited in the NW/SE oriented Potomac River Gorge, and being situated on a hill within it, inside the convergence w/ the Cabin John Creek Valley banked by higher terrain to the NE and SW. So it’s like putting your finger on a garden hose with those winds here. But any other direction, and it’s the opposite effect..we actually get *less* wind than just about everyone else when it’s from the N, NE, E, or SE. And comparable winds from the S and SW. Sort of a weird microclimatic effect, I guess. Strange winter according to stats Dca had all 3 months with Above average temperatures precipitation and snow fall I simply can't recall a stat quite like that then this winter. Phil a question for you.could one of the reasons why el ninos sucked and la ninas and cold neutul gave us big winters in the little ice age times could have played a part of the locations of the enso events meaning we had more often times east basin El ninos and La ninas as to oppose to the more recent trends? That, as well as the structure of the Indo-West Pacific Warm Pool, annular/meridional modes and their seasonality, cooler climate etc. It’s all interwoven. Better enjoy nice weather days like this as you know our suckage season is only a few months away. Wish we could combine the two threads for synoptic banter. Most of the Feb/Mar stuff is in the other thread. Mid-40s and drizzly this afternoon as the coastal skirts offshore. Snow fell in parts of Central NC this morning including Charlotte, which was its first April snow since 1982, or 37 years ago. You're right though. This has been one odd winter and spring is looking wonky. Storms this weekend with highs in the 80's. Nice gentle thunderstorm last night. Highs in the mid-70s again today. Tomorrow evening/overnight looks interesting. Strong windfield and anomalously high moisture fluxes/PWATs with high shear could make for a severe weather threat even beyond peak heating. Then Monday looks like a gusty day too..mid-April insolation + downsloping/CAA/pressure rises should lead to an overperformance in mixing based on history..~45mph looks doable west of the fall line per guidance despite winds not being ideally aligned with height. Tornado watch out for our reagion and there our tonado warnings with the line to the southwest also must watch for any discrete supercells that forum ahead of the line it self.also on top of that we got very strong winds aloft any of these storms could tap those winds at the surface tonight certainly has a shot to be legit tonight. Possable tornado on the ground in Fredrick county and Carroll county Maryland radar is showing legit tornadic signatures in that locations in fact radar was showing winds over 100 so any body in the path really should be taking this seriously. Tornado watch issued. Overnight QLCS possible with damaging winds and imbedded tornadoes. I’m also interested in the potential for strong gradient winds tomorrow afternoon. 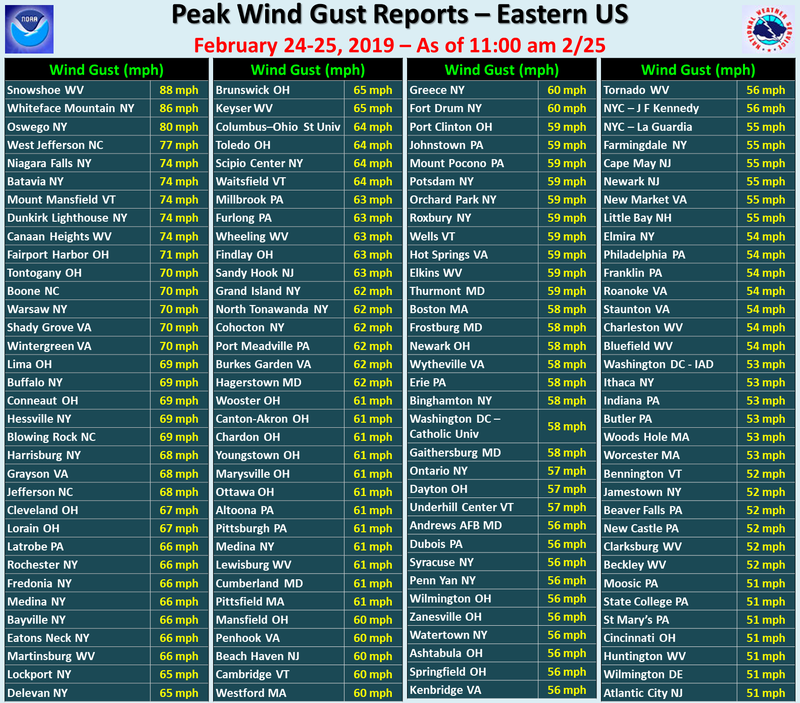 Yeah there are reports of 70 + mail winds being reported of course the Mountains out there may be enhancing the winds in the storms as well but it just gives you an indication to not sleep on these storms tonight. This was underwhelming locally. Some claps of thunder and a few hard gusts under the LLJ as some showers passed overhead and mixed it down (maybe 45mph). A few 60+mph gusts elsewhere across the region..DCA and IAD each gusted to 48mph, but so far it doesn’t look like a worst-case outcome. The strongest winds here will likely come from the cold advection/downsloping tomorrow afternoon. Wind is ripping this morning. Hitting 50-55mph repeatedly on my station as of 930AM. Hellacious gusts again after a lull. One of them got into the creek gulley and blew spray off the water and high into the air. the storms seemed to have got stronger on the Eastern Shore as del had a confermed ef2 tornado last night and another possable tornado that is being investigated on the Eastern shore.it seemed here the storms were in there beginning stages and really got going once they cross the bay. Another round of possible severe thunderstorms and heavy rain today and tonight tornado watch until midnight tonight.were see what happens. Tornado watch and a flash flood watch in effect, the former goes until midnight, this latter until 5AM. Dewpoints rising into the mid/upper 60s now as the LLJ cranks up. Definitely more mini-couplets today on velocity than last time. First (appetizer) round of downpours just rolled through here. Can’t call it a thunderstorm since I did not observe any thunder or lightning, but had a few gusts to ~ 30mph and sheets of rain. The more organized stuff is congealing to the southwest and should roll through this evening. yesterdays event literally crapped the bed here nothing to really write home about at all the real storms tracked to our west and east. 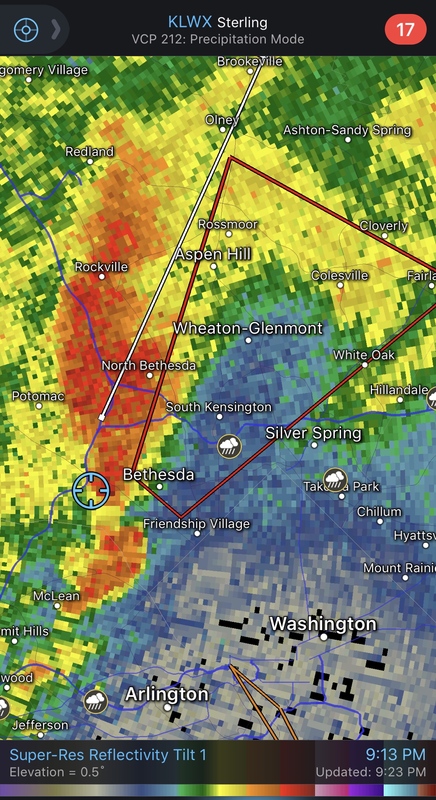 Tornado went through Reston last night, just a few blocks west of my Grandmother’s place. Houses condemned, trees snapped, etc. But luckily her place was fine. Just some minor tree damage. Another brief couplet passed a half mile to my south. Was very weak but winds did start from the E/NE with an onslaught of pouring rain, then winds blasted in from the S/SW, taking some small limbs and new leaves/needles off the trees. But nothing too strong. No thunder or lightning either, since temps were so warm aloft and convection was relatively shallow. All driven by shear/dynamics. Here’s an image as that thing just missed me..was probably off the ground too. Very weak circulation (I’m inside the circle). tornados are worse at night and especially in this case when the storms were not producing much if any lighting so you really have very little warning in realiseing one could be on the ground until it hits you.